Today would have been my due date. It is crazy to think I should be nervously and uncomfortably awaiting signs of labor right now. I should be feeling the stretches, kicks, and punches I'm so in love with from the inside. Don't get me wrong, I am beyond grateful for our beautiful, healthy little girl and I love having three extra months together. However, I can't help feeling cheated from the birth and pregnancy experience of my dreams. Moms of term babies might think I'm crazy for wanting to experience labor, delivery and the third trimester in all its painful glory. But its true! I wish like hell things had been different. Instead of a big prego belly and swollen ankles, we have a 3 month old baby!!! It's difficult to comprehend how much our lives have changed in 3 short months and on this day, I can't help but reflect on our journey. 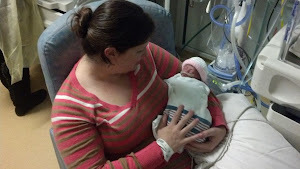 I have been working on Madeline's birth story for some time. Today, it seems appropriate to share this with all of you who have prayed, cried and celebrated along with us for the past 3 months. We appreciate you all very much! Will and I are planners. With that being said, when we found out we'd be meeting our daughter much earlier than expected, we weren't ready. Aside from her name, we had nothing. I developed pregnancy induced hypertension at approximately 20 weeks. My doctor, who seemed overly conservative with a few other issues earlier on, didn't appear to be concerned initially. However, she decided to have me perform the "gold standard" pre-eclampsia test, "just to be safe". It was Tuesday afternoon when I received a call that I needed to be evaluated at the hospital immediately. It was then I knew. I knew our life was about to change, and it was terrifying and exhilarating at the same time. I called Will at work and told him he needed to come home. I started to cry as I pulled out clothes I would need him to bring me when I didn't come back home that night. I knew. I was admitted to the hospital hoping we could extend my 26 week pregnancy for as long as possible. It was over the next several days my frustration set in. I've always been in control. How could I have absolutely no control of my body? 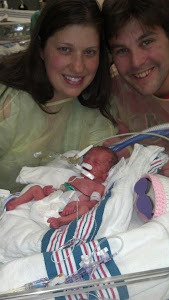 I watched as my vitals, and the baby's vitals were monitored...constantly! It was explained to me that the nature of Pre-E meant that while things were stable now, it could change quickly. My new reality set in after a few days. I wanted a crystal ball to plan for what was next. When will I deliver? When will I go home? Will she be ok? No one could answer my questions, but it eventually became clear that we were looking at a matter of days and maybe weeks, but not months...and certainly not the 3 months I needed to deliver a full term baby. We celebrated when things remained stable and, at one point, actually thought I might come home still pregnant. I began to fall into a routine. Sleep was interrupted every few hours to check things out (boy do I miss uninterrupted sleep), my blood would be drawn and doctors would round ridiculously early every morning. This began to feel normal. Every morning was the same at first, "everything looks stable for now, so we'll keep monitoring"... which was almost immediately followed by "but things can take a turn at any moment". It was the most unpredictable and uncontrollable situation I'd ever been in, and I could tell it was serious. There was nothing I could do to change the course of my condition and there was nothing that could have prevented it either. Will was amazing from the moment he received my call, and he stepped up to fulfill my needs without skipping a beat. I thought I couldn't love him more than I did before we began this journey, but I was wrong! He was my rock through this and I believe we have, and will continue to emerge from this journey stronger for having been through it! My mom arrived 3 days after I was admitted and it was a relief to have her for support. As wonderful as Will was, her help meant someone could be home with Baxter and with me every day. I missed my pup something fierce, so knowing he was well cared for was one less thing to worry about! I felt a sense of calm as soon as she walked into my hospital room. It was lost on me how serious my condition was at the time. It wasn't until several weeks later when she admitted she would go home and 'lose it' at night that I allowed myself to reflect on how sick I became. I'm not sure I can ever express what it meant to have her with Will and I during this time! 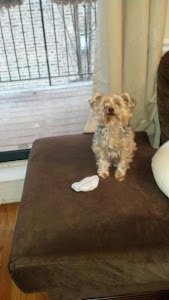 We spent our days walking the halls, catching up on last year's season of Revenge, and planning how we could smuggle Baxter into my room without getting caught. She didn't immediately purchase a return ticket home and on Sunday morning, after several days of status quot, we started discussing her return to VA since discharge (still pregnant) seemed possible. Oh, how quickly things change. The Oscars were on the night things "took a turn", but there were clues along the way that my condition was worsening. After almost a week of IVs and blood draws, my swelling had increased to a point where there was literally no viable vein left in either hand or arm. They called in specialists just to get a simple blood draw and I started to think about all the cute shoes I'd have to get rid of because surely my ankles and feet would never be the same! I began to develop a nagging headache and Sunday night, just hours after the "maybe I'll head back to VA because it looks like this could go on for weeks" conversation with my mom,and my blood pressure began to creep toward an unacceptable level. This prompted the doctors to administer IV medicine in an attempt to lower it...this was just the beginning. Just as they announced Argo for best picture, 3 nurses ran, yes ran, into my room with a look of concern on their faces. "We need to find the baby, you need to turn on your side". They searched for a heartbeat with the monitors over my belly and had me turn from side to side. It was the first time I was really scared since being admitted to the hospital. I could feel the nurse's hand shaking as she tried to remain calm. "Start an IV and call the doctor," she ordered the other nurses. After a few agonizing minutes, I finally heard the most beautiful sound of my baby's heartbeat. She explained that her heartbeat decelerated and I was being moved to labor and delivery for closer monitoring. In a flash, Will (who had somehow slept through the drama) was following me as I was wheeled, somewhat recklessly, to my new L&D room. I was hooked back up to the monitors with several doctors and nurses in the room, and it was explained to me that I would be monitored there because we were close to the OR "just in case". I remember the doctor saying I could go back to my room if things settled down with the baby...but I had a feeling I wouldn't be returning to my room with this baby still inside! Incredibly drowsy from the magnesium drip I had been on for hours and overall lack of sleep from the constant blood pressure/vitals monitoring, I moved to the not-exactly-meant-for-sleeping L&D bed and was told to "get some sleep"...HA! Actually, I do think I eventually succumbed to exhaustion and got some much needed sleep. I had a feeling of what the morning would bring, but I wouldn't let myself "go there" until I had to. Sure enough, when my doctors rounded the next morning, I was told in the most gentle way possible, that it was no longer healthy for me, or the baby, to remain pregnant. For the first time, I lost it. So many thoughts ran through my head at that moment. I was scared. Scared for my baby...she shouldn't be here yet! Then the guilt...oh the guilt! My body let me down, there was nothing I could do. I had one job and it was to cook this baby until she was ready...what kind of mother am I? Looking back now I can think rationally, but in that moment, I could not! Next, we spoke with a neonatologist who matter-of-factly explained what to expect after delivery. 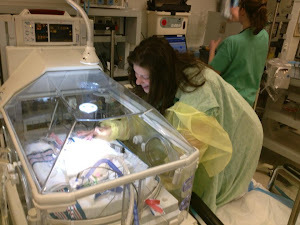 He went through possible scenarios and a host of common preemie complications. 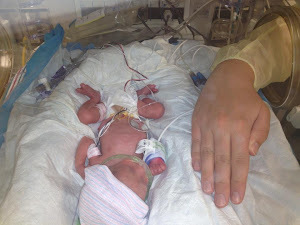 It was then we first heard of "brain bleeds" and "NEC"...horrible sounding complications that my tiny little baby could experience, all because I couldn't carry her to term. I wouldn't wish this kind of worry on my worst enemy. Bringing a child into this world is hard and scary enough, even in the most uncomplicated of circumstances. These worries continued to consume our every thought after Madeline was born...but that's another blog entirely! I spoke with my OB who explained how we would induce labor to try for a vaginal delivery. The world was spinning, and everything happened quickly. I was terrified of what was to come, yet, excited to meet my daughter! I would have given anything to stay pregnant and safely "cook" her to term, but that wasn't possible and I was ready to meet her! My OB began meds to induce labor, and I'll spare you details, but it became very clear that my body was NOT ready to deliver this baby! In and out of sleep, somehow over 24 hours elapsed...and still no real progress. 24 hours after I received the news that I would be delivering my daughter, her heart rate decelerated for at least a second (or possibly third) time..details are a little fuzzy. The OB on service that day was standing by me, staring at the monitor and said, "I'm standing here because if this happens again, we'll have to take you to the OR for a c-section." Her face was serious and I was in a daze. I was running on very little sleep and by that time was on magnesium, morphine and had just received an epidural! I was exhausted! To be very honest, I wasn't sure how I would possibly have the strength to push this baby, albeit teeny baby, out of my body. I remember thinking, why? Why are we waiting? Why are we risking another heart deceleration? I mean, her heart is slowing down! Through my drug and exhaustion induced haze, I spoke up. "Why are we waiting, can we just do this now?" My OB turned to me with a look of relief...."yes", she said. I'm so thankful for her response because on a day where I had no control over anything else, she confirmed in that moment that my first decision as a mommy was a good one. My cesarian wasn't an emergency, "emergent" is what they called it. Either way, within minutes I was being prepped for surgery. SURGERY! Up until this point, the most significant health issue I'd ever had was a few stitches when I was a kid. Now I'm having surgery?!? I wish in the moment I was more alert. But to be completely honest, I was about to have a baby and I could barely keep my eyes open! Will was beside me with the best brave face he could muster for me and our little girl. He rubbed my head as we both anxiously awaited the moment. It was only a matter of minutes until we heard "congratulations mom and dad, its a girl." Then the neonatologist quickly said, "turn your head," and that was when I first saw her. A brief blur in my peripheral vision, but Madeline was here and she was beautiful! Then, I heard the most beautiful sound, the sound of my baby's cry! I wasn't sure what to expect, she was so early! I must not have expected to hear a cry because I remember feeling surprised when we were able to hear her! Her cry sounded more like a cat's meow than a human cry...but it was the most beautiful sound nonetheless! A minute or two later, the doctor called Will over to her. I was so relieved because this meant she was stable enough for him to snap a few pictures...this meant she was breathing on her own! It seemed like an eternity, but really was only a few minutes before Will returned to my side with pictures on his phone. She was beautiful and looked just like her daddy! She didn't seem that small in the pictures, but she was! 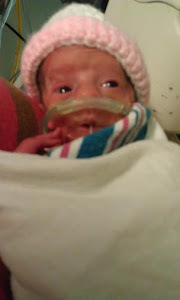 At a birth weight of 880 grams or 1lb 15oz...she was small, scary small! Will was so proud of his little girl though, you would have never known by the look in his eyes that she was as small and fragile as she was. Because I had to wait for the magnesium sulfate medication to finish before I could get out of bed, I didn't get the chance to experience her for another long 24 hours. Thankfully my room was very close to the NICU because Will bounced back and forth regularly with updates, and more pictures! The next morning, I anxiously awaited finishing that awful mag drip! Being confined to bed tried every ounce of patience I had, and those who know me must know how difficult that was! I needed to see my girl! I needed to feel like a mom! 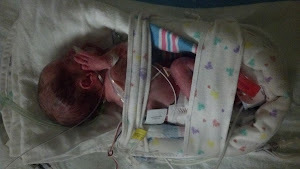 Walking into the NICU was surreal. I didn't know how I would feel seeing her attached to machines, IVs and in an incubator...nothing can really prepare you for that. Surprisingly, my first feeling was that of relief. Don't get me wrong, she was scary small and I felt like I would break her with the slightest touch of my hand. I'm sure I was scared. Her hands and feet were the size of the tips of our fingers, and her head was no larger than a tennis ball. Her skin was translucent and she had a beautiful head of brown hair! I couldn't believe she was here and no longer in my belly but I just knew she would be ok! Perhaps it was denial or naivete, but I believe, for really the first time in my life, I was coping through sheer faith. Certainly I had no control, so I had to believe a higher power was at work here. She is a miracle, of that I have no doubt! The next several hours/days/months were filled with so many emotions...happiness, sadness, fear, and exhaustion. I was a mess emotionally! I had a daughter....but I couldn't hold her, kiss her cheeks and forehead or feel the snuggle of her skin against my chest...and forget about bringing her home ANY time soon. Every birth story I had ever heard talked about an intense love and mommy connection that consumes you as soon as you see your baby. I loved her to the moon and back, but I didn't feel like a mom. She didn't need me, she needed so much more than I could give. In fact, in those early days, I felt like I might be doing more harm than good. This was not how its supposed to be, but it was our new reality. Looking back now, I wish I could have told myself..."it gets better, just wait, its so worth it!" And it is..it so is! So there our birth story ends, and the rest of our life as a family of 3 begins. It has been a beautiful experience to see Madeline overachieve her way through the challenges and promised roller coaster of ups and downs during her first two months of life. With that behind us...I can't wait to see what's next! Here is a look back in pictures..we've come a long way!! Kristen...Your story brought tears to my eyes. I've silently been watching Madeline's progress and praying my heart out like all the rest. I'm thrilled you have your happy ending. And rest assured, my sweet, you ARE a mom whether you carried that child nine months or not. And given the wonderful example you've had your entire life, you're already a fantastic mom! Much love to all. I hope to one day get the chance to meet your beautiful daughter. Kristen – Thank you for sharing your experience and thank Will for his diligence in keeping us up-to-date on Madeline and your progress throughout this whole experience. Madeline is a true miracle from God and such a reminder to us that we are not in control and He is. I thank you Father for Your graciousness and blessing upon Madeline, Kristen and Will, what a joy it is to see Your hand at work.